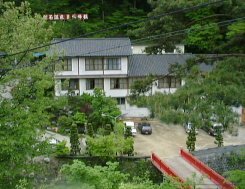 It is said that Sakiishi hot spring Unpo-so was crowded long ago as a base of Daibosatsu pass climbing. There is no popularity now. Because a national route was improved, we can go to the Sakiishi hot spring easily. 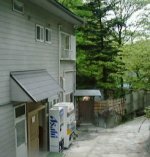 Therefore, there is no atmosphere of a hidden hot spring. We offered bathing. The attitude of which landlady was ill. Another charge is necessary when you use the inside bath. There is a roof of the stone over the open-air bath. The open-air bath is in the new building at the side of the river. Previous visitors were young couple. This open-air bath is mixed bathing. 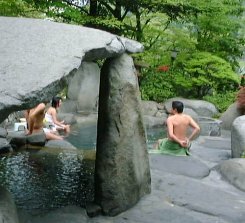 The hot spring of mixed bathing is rare near Tokyo. Hot water is transparent, and it is alkalinity. It thinks that water is heated. It was made hot, and it was pleasant. The open-air bath goes from this building. Get off central expressway Katsunuma IC. Go in Oume direction along Route 411 (Oume road). A parking lot is in Unpo-so about 10 units.